After two nights of incredible performances, you certainly aren't going to want to miss the last night of Coachella Weekend One. Stream tonight's lineup on YouTube starting at 6:30 p.m. EST. Channel 1 is posted above, which is a live stream of the main stage. Channels 2 and 3 are posted below. 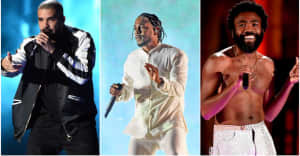 Majid Jordan at 6:35 p.m.
DJ Khaled at 11:10 p.m.
Kendrick Lamar at 1:45 a.m.
For more info and to see the full performance schedule go to Coachella's website.